I was extremely excited to have the opportunity to interview a popular new character from The Office. 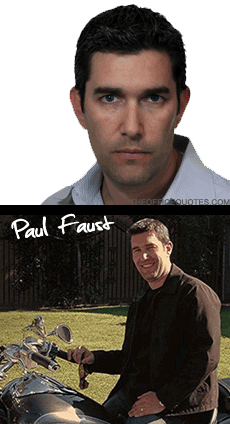 Paul Faust shares the name of the character he plays and was introduced to fans in the last episode, Chair Model. He plays the manager of Disaster Kits Limited, another business in the Scranton Business Park. In real life Paul is from New York and actually runs the real Disaster Kits Limited! I asked Paul a few questions about his character and his experience on The Office. You live in New York (with the show being produced in Los Angeles) and you're not a full-time actor... How were you cast for the role of Paul Faust? I was out in LA last year and through some personal contacts I spent a few hours on the set of the show. At one point I met all the writers and told them about me and what I do. I guess I made an impression on B.J. and he wrote this small part that I was the inspiration for. They were auditioning actors for the part and I don't think they liked anybody and somebody suggested that they let me read for it. I got an email on an early Wednesday afternoon asking me if I had an interest in reading for the part. After I picked myself up off the floor... I said yes. Now, mind you, I was in NY... it was mid-day Wednesday and the scene was scheduled to shoot early Thursday morning in California. They emailed me the script and told me to video tape myself reading the lines and to email them the video. So I am in my office in NY with a script and no video camera. I ran down the block to the local camera store and asked for help. They grabbed a digital camera and videotaped me reading the lines. They then put it on a disc and I ran back to my office and spent the next 15 minutes trying to find a program that would allow me to send video to someone. I emailed them the clip of me reading the lines and about 20 minutes later - this is now about 3:00 in the afternoon NY time - I got a reply saying "You got the part, get to LA." In the span of the next hour and a half they made flight and hotel arrangements for me. My wife packed me a bag and raced it to my office and I was in a car to the airport. I got on my plane at about 9:00pm Wednesday NY time but we didn't take off until 10:30ish due to bad weather. I landed in LA on Thursday morning at about 1:30am... and guess whose bag was the only bag they lost. MINE!! So I headed to the hotel with the clothes on my back. I got to the hotel at about 2:15. At the front desk I checked in and was given an envelope by the front desk folks which had all sorts of instructions like call sheets, directions to the set, etc. Now, not being a "seasoned" actor, reading a call sheet was sort of like trying to decipher hieroglyphics. I finally got myself organized and got to sleep at 3:15am. I woke up at 5:00, jumped in the shower and headed off to the set to shoot my scene. From the first email (with me in NY) to wrapping my scene (in LA) was something like 24 hours start to finish. It was pretty crazy. Was it intimidating working alongside a small cast of actors your first time acting? Were you a big fan of The Office before you were cast? What kind of role will your character be playing in future episodes? I have no idea. They haven't told me anything. I would very much like to continue to be a part of this show. So what was it like behind the scenes of The Office! Can you give a quick recap of what a full day of filming is like? Every single person I encountered on the set was great. It is truly like a family. The best part about it was that from the moment I arrived they made me feel like I was part of their family. There was no feeling like I was the new guy or outsider. Everyone treated me great. From the moment I got there... you can just tell that these people all love working on the show. As far as being new to working on a show like this, it was amazing to see all the different parts that go into shooting even one scene. I think that as a TV fan it was great to take a "peek behind the curtains." It literally takes hours just to shoot one scene that may only get 30 seconds to a minute during the episode and that doesn't even take into account the hours to write the scene, create the sets, etc. It certainly gave me a new appreciation for all the work that goes into making a show like this. I can only give you my experience as to a full day of shooting. Right when I arrived it was into wardrobe and then hair and make-up. Once I was all "ready to go" I had to wait for a little bit while they shot some other scenes. This gave me a chance to grab breakfast and panic some more over my couple of lines. Once it was time for my scene they brought us over to the place where we were going to shoot the scene. We all got our microphones on and last minute props. After that we went to the set and did a quick read around of these scenes. I think this was done to get everyone (mostly me,) comfortable and to figure out the positions of both the actors and the cameras. After a couple reads we were ready to go and we shot the scene. We shot the scene many times with small tweaks here and there. Sometimes the tweaks were to a line or the timing of a line and sometimes the tweaks were to the camera positions. Every once in awhile we had to re-shoot because someone forgot a line or laughed. Keep in mind that the regular characters are all extremely funny and talented. It is borderline impossible to keep a straight face. I truly believe that at anytime they could make the other people in the scene laugh. It was really an honor that I got to work with them. I definitely can't wait to see what future roles the Five Families will play in upcoming episodes and hopefully we get to see some more of Paul Faust! Thanks Paul!